Yes, Joe sat through (suffered through?) the 25-minute news conference that introduced Kwon Alexander to the San Francisco-area media. A couple of interesting nuggets emerged. The first came as Bucs icon and 49ers general manager John Lynch talked about how Kwon raises the game of those around him. If that’s true, the Bucs are in deep, deep trouble. There is a reason Bucs officials and players called Kwon the heartbeat of the defense, which was sort of like calling a guy the heartbeat of a corpse. But again, if Kwon was a guy who made players better even if the results didn’t materialize, then Joe sure hopes the Bucs find a way to replace him. So far, they have not. Also, Lynch talked about the importance of the pass rush and gave a very short and sweet explanation Bucs fans will understand. Powerful take there by Lynch, as he sat alongside Kwon and beastly pass rusher Dee Ford, who was traded to San Francisco by the Chiefs and signed a new contract. And that’s exactly why Joe wants the Bucs to land a manbeast defensive lineman with the No. 5 overall pick. Fun fact: Kwon said ex-Bucs receiver Louis Murphy helped convince him to play for the 49ers. Murphy played there in 2017. Right on the money there, Pepsi. The contract coming off injury still stuns me. Good job Murphy. The Bucs defense should be a lot smarter now and lined up better. Let’s not forget Kwon had trouble calling the defensive plays and Lavonte David had to call them. Happy for Kwon gettin paid but I’m not gonna MISS THE BAD ANGLES AND MISSED TACKLES. Bucs lost with him. Bucs can lose without him. No big loss. Salty @ss fans. Who cares if u didn’t like him. Have some class, he gave his heart and soul for this team. Put us on his back a few games. Save your classlessness for people like DJax who did nothing here but cry. Good luck Kwon, well deserved. We lost a young, great player in Kwon…but seeing we have a great coaching staff for our team which is something we haven’t had in awhile why don’t y’all give them a chance? Majority of the teams that were signing, trading and giving out huge contracts are teams that aren’t usually any good, and people are trying to figure out why the Colts didn’t spend much money. Bruce Arians and Todd Bowles and gonna to be the root of changing Buccaneer culture, and by mid season you guys won’t be thinking about Kwon or Humphries when you realize the success starts with evaluation and coaching. How can anyone “love his leadership” if all he led his team was losing? You haters are correct. Cut or trade all 11 starters since we left. Replace them with AAFL players I guess. Don’t over think this Bucs. This is one of the best DLine drafts in a long time. Get a Defensive line player in the first round. Who knows? The SF Bay area might breathe new life into Kwon. Hope so for his sake. Sometimes a change does make a better player..sometimes. Good luck Kwon. You got paid. Personally though, I don’t think we lost that much at all. Have fun paying a subpar, injury prone LB 13 mil a year for the next 4! 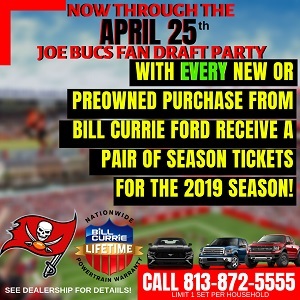 stop being salty fans….lol….had kwon resigned folks would be rejoicing and happy as ever…..now that he’s signed elsewhere, folks want to bash him and claim good riddance….lol…. 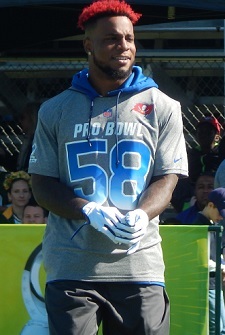 folks act like he was will gholston….lol….the man made the pro bowl in 2017 calling plays and playing in a trash outdated system led by smitty…..
i am happy kwon was a buc and wish him well…..he was one of the few true leaders on the team….besides winston, kwon was the only player to jump on baker…..not GMC, not LVD, not gholston, not grimes, not conte, not mike evans…..winston and kwon…..
good luck, money was well deserved….. Yet, Joe (at least one of them) is acting ridiculous and is going to flip out if we drsft the best LB in the nation at #5 overall…. That is absurd. White is the pick, fellas. I mean he HAS to be the pick, right? Kwon hit the lotto, not worth the money. good but undisciplined player, also injury prone. GOOD LUCK. Actually someone did a big write-up on Kwon and compared the Bucs defense with and without Kwon on the field, and in every single category the Bucs defense was better with Kwon on the field, every category. The idea suddenly that Kwon isn’t a good player and the Bucs defense didn’t miss him is 100% fake news. I wish we could have kept him but I agree that the contracts being thrown around were just too high. Also, yes, David is a year-in year-out all-pro LB who gets zero respect on the national state and in a tier higher than Kwon, but he signed his contract like 5-years ago. Comparing pay of a 5 year deal to current is retarded. Anywho I have very little doubt that Kwon goes out to San Fran and is a year in and year our pro-bowler who might even get an all-pro 2nd team award once. It won’t happen next year since I figure he won’t be at 100% until, at earliest, halfway through the season, but those mocking this deal, when a lesser guy like Barr got the same money, well, you’re dopes. The Bucs couldn’t afford him right now, but that doesn’t mean he’s not any good. Kwon makes guys around him better. McCoy makes guys around him better… they must of cancelled each other out. Like magnets. I mean, what do you expect Lynch to say? ALSO, if the Bucs would have kept this guy at $13mil/yr they’d have been considered “Bat Sh*t” Crazy!!! The only Bucs’ defenders that have proven worthy of a deal even close to that are Brooks & Sapp, and they’d have been considered dramatically overpaid during the time they suited up. I wish the best of luck to Kwon, but he’ll need to be a perennial ALL PRO for 3 years+ to prevent inclusion in the latest class of extremely overpaid free agents.